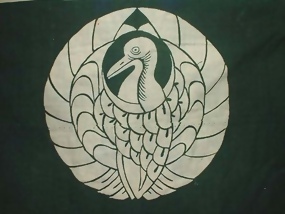 Antique Tansu cover (yutan) with a family crest of crane. There are few Yutans left in original shape like this one. The fabric is a loosely hand woven cotton and is made to fit over the tansu (cabinet), the size of 40" by 18". This cover can be dissembled into a flat cloth of 27 inches by 118 inches. The condition of the fabric appears to be in new condition with two holes between the 72" to 74" location. The color is uneven in some area; small areas show blue than green, some uneven color spots.